The massive mandate in favour of Narendra Modi has been a gamechanger in the country’s politics. Most politicians are like chameleons, changing colour when it suits them; with the changes blowing in the wind, a lot of that can be expected to happen in the near future. And while some may have scruples about switching parties outright, many would not mind taking whatever steps are necessary to get on the right side of a Prime Minister, who commands the support of 336 NDA MPs. Veteran Mizo politician Lal Thanhawla is one man who has been making the right noises. He defied the AICC’s diktat and flew to Delhi to attend Narendra Modi’s coronation as Prime Minister on 26 May. Subsequently, he also called on Mr Modi and it is be any body’s guess what the two leaders spoke about besides developmental issues and the fund crunch faced by Mizoram. “My guess is as good as yours,” remarked a Mizo leader, considered a rebel in the Mizoram Congress. Some Congress legislators in Mizoram are upset with Pu Lal Thanhawla because they missed out on ministerial berths and are said to be fomenting a rebellion against Lal Thanhawla’s monopoly over the Congress party in Mizoram for last three decades. There is no doubt that Lal Thanhawla remains the undisputed ‘local leader’ who has led the Congress to success after success, becoming, in December 2013, chief minister of Mizoram for a record 5th term. In fact, his success was the only saving grace for Sonia Gandhi when the Congress party was humbled by BJP across western and central India in Rajasthan, Chhattisgarh and Madhya Pradesh and by the BJP and the AAP in Delhi. But Lal Thanhawla’s problems are many. Even if insurgency is virtually a matter of the past in Mizoram, the economic woes are as serious as they used to be. The state administration is reeling under an acute financial crunch. Lal Thanhawla, observers say, is clueless how to steer the state government out of its financial impasse. Another dilemma is how to handle the possible rebellion building up in the Congress. The Congress has 34 MLAs in the 40-member Mizoram assembly but he could accommodate only 12 ministers (including himself) and 7 parliamentary secretaries. The other legislators who missed out on berths are fast losing their patience. Age is also catching up with someone who was born in 1942. 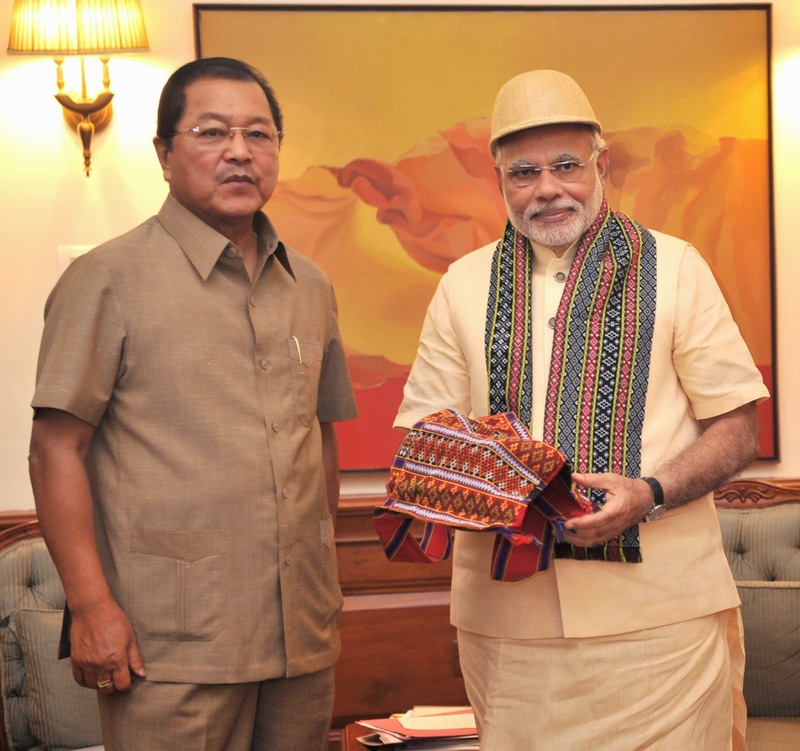 Lal Thanhawla may also be reaching out to the Prime Minister and the BJP to forestall any move on the part of the BJP’s close friend, the Mizo National Front and its leader Zoramthanga to stir up trouble inside the Mizoram Congress. The causes of the fiscal crunch in states like Mizoram have been the subject of much debate among North-east politicians and observers. The changed pattern of Central funding since the 1990s as recommended by the 9th Finance Commission is also blamed. The golden days in the North-east when politicians flourished on the generous central funding have come and gone without the common citizens really reaping the benefits. There has been rising inequality as corruption thrived. Government jobs vanished and as the funding pattern changed, things appear to be headed into a dark tunnel. The refrain among North-east politicians has been that it is a commitment of the government of India to supplement the revenue of the states like Mizoram and Nagaland, dipping into the Consolidated Fund of India if necessary. The likes of Lal Thanhawla and Zoramthanga or Naga politicians like S C Jamir, Vamuzo or Neiphiu Rio have always argued that economic viability was not a consideration when states like Mizoram and Nagaland were granted statehood. Rather it was a culmination of political negotiations and hence the respective statehood agreements should be honoured in letter and spirit. But Lal Thanhawla is one of the few pragmatic politicians of the North-east and he knows mere argument cannot save the day for him. He needs a friendlier regime in Delhi so that the state is bailed out of the crisis and at a personal level, he has a security firewall against possible rebellion in the state Congress. Lal Thanhawla has himself made it clear that he would not quit Congress or float a pro-BJP regional party. At the same time, despite his personal friendship with Sonia Gandhi’s family, he reportedly told his aides that he is sceptical of Rahul Gandhi’s utility factor in reviving the Congress. Personally, Lal Thanhawla seemed to have reconciled to the reality of the Modi phenomenon and he did not hesitate to declare that religious sensitivities of Christian-dominated Mizoram would not be affected by the policies of a supposedly Hindutva party like the BJP. If ‘winner takes all’ is a phrase that suits Mr Modi today, to be on the right side of that winner is the pragmatism of Lal Thanhawla.